Concerto for Horn und Orchestra, No. 2 E flat major, KV 417 composed by Wolfgang Amadeus Mozart (1756-1791). Edited by Franz Giegling. Arranged by Dominic Nunns / Martin Schelhaas / Timothy Brown. For solo horn/piano. This edition: Stapled, Urtext edition. Stapled. Mit Eingangen. Level 4; UK Grade 6. Piano reduction, Part(s). Language: German/English. No. 2. 24/7/7/1 pages. Duration 14 minutes. 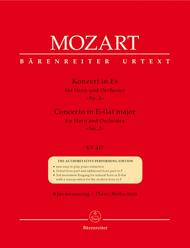 Published by Baerenreiter Verlag (BA.BA5311-90).ISBN 9790006467143. With Language: German/English. 31 x 24.3 cm inches.